I recall hearing good things about the Farm on Adderley, but for the life of me I can’t remember where. The restaurant is only a short distance from where I live, so I decided to grab lunch there recently. My disappointment started when I saw the lunch menu. 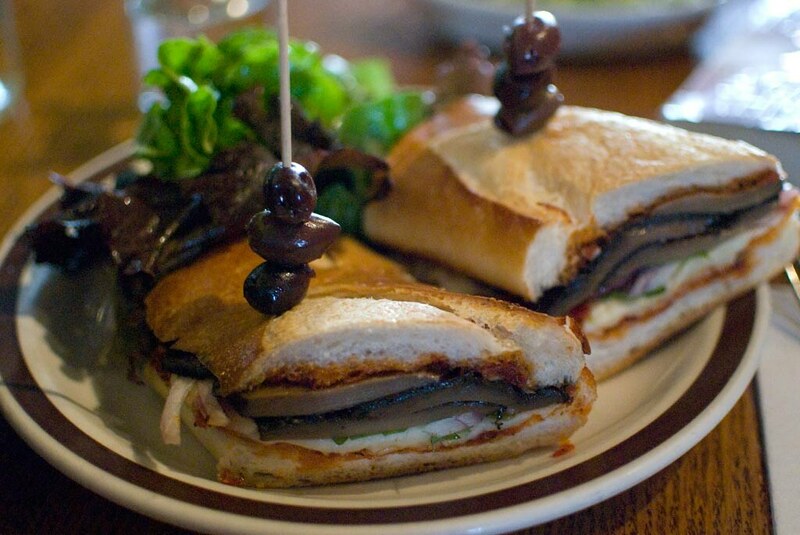 The only vegetarian entree option was a portobello sandwich ($8). I’m a huge fan of mushrooms, but I don’t really like portobellos — I think of them as “the lazy chef’s vegetarian option”. True to form, the Farm on Adderley flavors their portobello with vinegar (they refer to it as a confit, but it didn’t seem any different than a dozen other portobello sandwiches I’ve had before). The baguette was nice and crusty, and the sun-dried tomato pesto was quite tasty and spread on both sides of the sandwich. There were a few strands of raw onion on the sandwich, though they added nothing but texture. Strangest of all were the olives — what was the point? 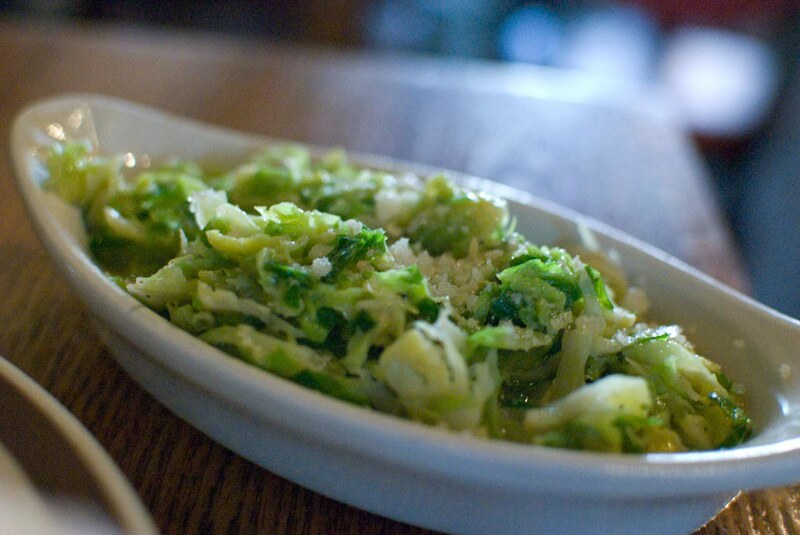 Slightly better was my side of brussels sprouts ($5), shredded and swimming in a broth of butter and parmesan. I prefer my brussels spouts caramelized and with slightly more salt; I know that brussels sprouts are now kind of menu-trendy, but it seems like most of the time they are cooked in such a way that they lose all of their flavor. It could be that chefs get complaints from people who are ordering brussels sprouts for the first time, but when cooked like this they could have been any green vegetable. I love brussels sprouts, and I want t taste them! So what am I missing? The Farm on Adderley seems like the kind of restaurant I’d like, but I just wasn’t feeling it. Maybe the dinner menu is different, but I was pretty disappointed in my lunch.